This is just one of many statistics regarding breast cancer and during the month of October, Breast Cancer Awareness Month, many women (and men) will educate themselves further on breast cancer. One area of focus is screening and risk factors. For example, more than 40 percent of women age 40 and older are estimated to have dense breasts. And, according to the Journal of the National Cancer Institute, women with dense breast tissue are four to five times more likely to get breast cancer than women who do not. The American College of Radiology guidelines recommend annual screenings at the age of 40 - but what screening is best for detection? Mammograms? MRI? There is a lot of confusion about risk factors for breast cancer and many articles that support women at high-risk getting an MRI annually. What are the factors that increase risk of breast cancer? Shields MRI is shedding light on what the experts REALLY say about women at high-risk and recommendations on when to get an annual MRI screening. Despite some variance, these medical organizations affirm that if you show one of these factors that put you are at higher risk for breast cancer, annual screening MRIs are often recommended. 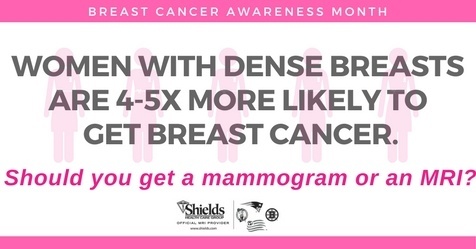 Shields offers breast MRI services at fifteen locations throughout our network including: Brighton, Brockton, Dartmouth, Greenfield, Hyannis, Leominster, Lowell, Marlborough, New Bedford, Newburyport, Palmer, Springfield, Weymouth, Woburn, Worcester. To make an appointment, call 1-800-258-4674. Are Annual Screening MRI Recommended? Annual mammogram and annual MRI starting by age 30 but not before age 25. Recommended every year starting at age 30 or age recommended by health care provider. Annual MRI starting 8 years after treatment(If received between the ages of 10-30); Annual mammography is also recommended, but not before age 25. Annual mammography from time of diagnosis; either annual MRI or ultrasound can also be considered. Talk with your healthcare provider and consider starting at age 30.